Update – FAIL Don’t Buy – This did not ream out a big enough hole for a pipe to go in, so it is basically useless. While trying to replace the pump and motor on my hot tub I broke the PVC pipe at the valve. The big problem is the male part of the valve pipe was still inside the 2″ pipe that contains the safety suction sensor. A replacement is not available locally and if I figured it out correctly ordering it online was in the $75 range. This part of the plumbing was still good except for the broke off pipe glued in it. I asked Google for a way to salvage this coupling and came up with something called the Socket Saver. 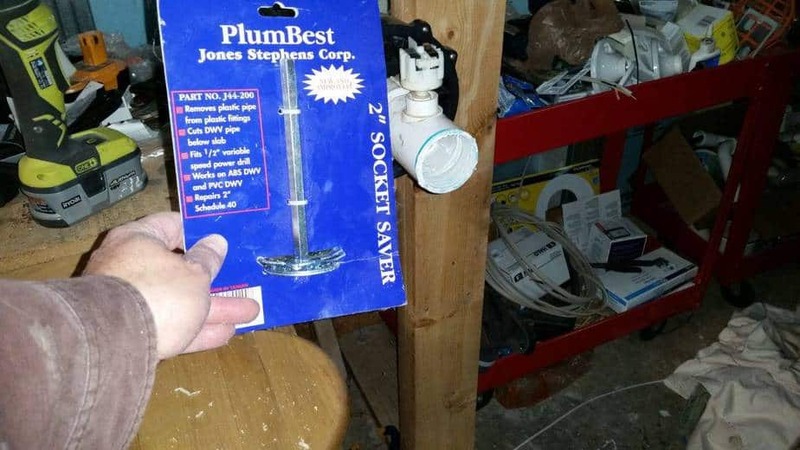 It basically cuts out the pipe in the socket so you can re-use it. Normally I would just buy a replacement pipe fitting, but in some cases a replacement isn’t easily available or would require cutting out a lot of other plumbing. In those cases the Socket Saver may be just what you need. You do need a different one for each size pipe and the 2″ one I’m using does require a 1/2″ drill. It appears to have worked, but I will have to reserve my final judgement until after it has been glued up in the hot tub for a while. My only concern is the inside is a bit rough, but since PVC pipe is joined using a solvent that chemically melts the pipe together I think it will be OK. Plumbing disaster turns into cool discovery! Today my kitchen sink had a major clog. I first tried liquid plumber “power gel” and that had zero effect. Since this drain was hooked into a garbage disposal I had to get in there with my channel locks and disconnect the trap so I could run the auger through the line. Of course I man handled the pipe and it broke. Ok, not big deal the hardware store is still open… not the end of the world. I’ll just take the auger and clear out the gunk and then go get a new trap. The auger is spinning it is hitting the clog like it is made of cement and not moving at all. At this point I’m seeing red so I know it is time to take a break. I leave to the hardware store and after I grab a new trap I decide to look over the plethora of drain cleaning devices available at the hardware store. There are motorized augers which are like $100 or more and other normal augers like mine except with fancier handles, there was even a slim plastic rod for $2 which claimed several miracles on the packaging. With visions of myself failing, calling a plumber with my tail between my legs, my eyes catch a simple device for $5. It is called the Drain Cleaning Bladder by Cobra Products. I had a summer job for my father who was a civil engineer. What I did was throw smoke bombs down manholes and then run through yards with a Polaroid camera taking pictures of smoke coming out of the ground. Sounds like a good way to get shot huh? We had sent notices to everyone weeks beforehand but we still got yelled at on occasion. Well the reason I mention this is because a few times when we were out on the job there would be a legitimate blockage in the sewer, well what the fire department would do is plug off one end of a fire hose and turn it on. It would launch through the sewer with all the force of the water behind it and you would literally see trash and crap spew out the manhole down the street. It was pretty awesome to see that. Well this thing reminded me of this. I got home and attached this to my garden hose and stuffed it into the drain. I would say I ran this device for about 15 seconds before it had my entire pipe nice and squeaky clean. In conclusion this simple $5 device is pretty friggin’ awesome and made my night almost pleasurable. Author Nick-LaDieuPosted on October 6, 2010 October 15, 2010 Categories BlogTags plumbing10 Comments on Plumbing disaster turns into cool discovery!